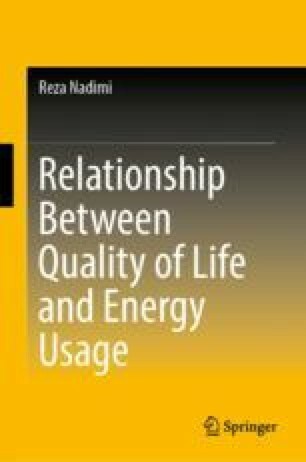 The previous chapter made a brief explanation about energy production and consumption, human development, QoL and its interaction with human energy needs. The capability approach was introduced as an approach to use in this study to construct QoL indicator. Moreover, a review was carried out for previous researches regarding energy and QoL, then emphasized the contribution of this study. This chapter provides a foundation for the rest of chapters through introducing mathematical principles to construct a proposed QoL indicator. The proposed QoL indicator data are modeled against total primary energy supply (TPES) data, to illustrate how QoL changes with variation of the TPES. The results are compared with similar researches in which variation of Human Development Index (HDI) and TPES have been addressed. Some scholars have addressed the relationship between the HDI and energy consumption in terms of the semi-logarithmic or hyperbolic function. One of the results from this relationship is to divide the world countries into two categories, developed and developing countries. According to this classification, pre-developing and developing countries are located into one category (developing), while the proportion of people with fundamental energy needs in the former is far higher than in the latter. The objective of this chapter is to allocate a separate class for pre-developing countries which their fundamental energy needs have not completely satisfied. The methodology section in this chapter is divided into two parts. Initially, based on the longitudinal data (112 country’s data during the period of 2005–2013), a linear QoL indicator is proposed in terms of six variables. Then an S-shape (sigmoid) curve is fitted to the QoL indicator data against TPES per capita (or Energy consumption per capita, ECpc) and electricity consumption per capita (Elcpc) data. Three types of countries, developed, developing, and pre-developing are identified based on the sigmoid function. The results of the proposed model demonstrate that the “pre-developing” category has different QoL and ECpc as compared to developing and developed classes that demands different energy policy in global energy strategy establishment. Another result of this chapter is that the entry of new technologies has influenced the QoL and Elcpc to a greater extent in developing countries than in developed countries. One-way analysis of variance is a method to shed light on the latter consequence. In the case of pre-developing countries, the pertinent analysis shows an insignificant impact. This chapter concludes the new classification of countries appropriately addresses variation of QoL against ECpc in each class. The names of 112 countries have been ordered in Table 2.7 alphabet. where each xl is assigned to just one si. Fourth: The K-means will converge for the common similarity measure mentioned above to yield the least WCSS. Fifth: The steps above are iterated until relatively few points change clusters. The following table demonstrates the progress or the regress of each country, during a period of time at which they belonged to the pre-developing class. Calculations were carried out based upon two years (the first and last years) which a country was in the pre-developing class. For instance, the MYS values [normalized value based on Eq. (2.1)] for Angola were 0.25 and 0.219 for the year 2005 and 2013, respectively (decreasing trend). In this case, the regressed value equals to 0.876. Majority of countries had a decreasing or increasing trend. There was a rare situation in which a variable in a country did not have a trend. Therefore, by assuming a decreasing or increasing trend in the variables, the last row of the following table displays the slow progress for three variables of the QoL indicator (IHR, GNI, and IWA) as well as Elcpc and ECpc variables. A significant regress is observable for the rest of variables (MYS, GDP, and LEB). In contrast, the QoL value has been had a slight regress during of nine years. Despite the increase in the energy consumption, some of the QoL variables in pre-developing class came across a significant decrease, and others faced a slight increase (Average Elcpc increase, without a change in the average QoL). Generally, mismanagement, high rate of poverty (limited power over their work and business), and war can cause such unexpected changes (Table 2.8).